Contact Lenses v Laser Eye Surgery – Which is Better? We evaluated the visual, refractive and ocular aberrometric outcomes after wavefront-guided (WFG) laser in situ keratomileusis (LASIK) for the correction of myopia using an excimer laser platform with Iris Registration (IR) technology (STAR S4IR excimer laser, Abbott Medical Optics, Santa Ana, CA, USA) and combined with a new Hartmann-Shack wavefront sensor (iDesign aberrometer, Abbott Medical Optics, Santa Ana, CA, USA) capturing 1250 data points from a 7.0-mm pupil and using Fourier reconstruction for aberration data. Specifically, we conducted a prospective case series study including 92 eyes of 46 patients with ages between 22 and 46 years and undergoing WFG femto-LASIK for the correction of myopia and myopic astigmatism using the Advanced CustomVue platform that combines the excimer laser and the new Hartmann-Shack aberrometer as previously mentioned. Mean preoperative manifest sphere and cylinder were 2.81 ± 2.27 D (range, +0.75 to −10.25 D) and −1.22 ± 1.14 D (range, −4.00 to −0.12 D), respectively. In all cases, corneal flaps were created using the iFS femtosecond laser (Abbott Medical Optics, Inc). The visual, refractive and ocular aberrometric outcomes were evaluated during a 3-month follow-up period. 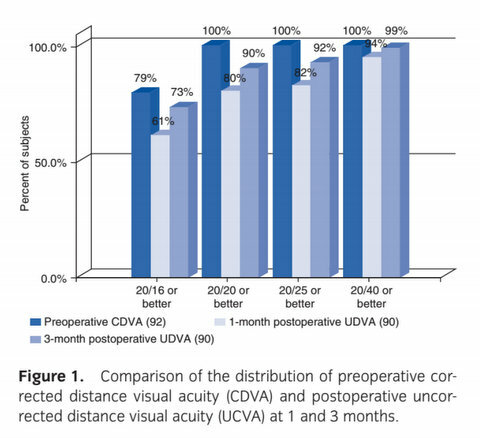 At 3 months after surgery, the percentage of eyes that achieved 20/20, 20/25 and 20/40 uncorrected distance visual acuity were 90%, 92% and 99%, respectively (Fig. 1). Postoperative manifest spherical equivalent was within 0.5 D and 1.0 D of emmetropia in 96.7% and 100% of cases, respectively. There were no eyes with a loss of two or more lines of corrected distance visual acuity. These results are consistent with those reported recently by Schallhorn et al.1 using the same technology and also for myopic eyes. Likewise, our visual and refractive outcomes are similar and sometimes better than those reported for myopic WFG-LASIK by a great variety of authors with the last generation of excimer laser platforms.2,3 The combination of the STAR S4IR excimer laser with the new aberrometry technology used in the current series seems to optimize the efficacy and especially the predictability of WFG-LASIK compared to the previous version of such technology.2,4 It should be noted that this new aberrometer is the result of the refinement of a previous Hartmann-Shack wavefront sensor, the WaveScan, with a lower sampling ability and without Fourier data reconstruction. Besides visual and refractive outcomes, ocular aberrometric changes were also evaluated. To date, this is the first study evaluating the aberrometric outcomes of WFG-LASIK using the evaluated technology. Mean change in higher order aberration (HOA) root mean square and primary spherical aberration (5-mm pupil) was +0.04 ± 0.09 μm (P < 0.01) and +0.01 ± 0.06 μm (P = 0.42), respectively. This change in primary spherical aberration was lower than that reported by some authors evaluating the aberrometric changes after WFG-LASIK for the correction of a similar range of myopic refractive errors and the same pupil of analysis.5,6 Khalifa and colleagues6 found in a sample of myopic eyes with spherical equivalent ranging from −6.63 to 0.00 D that the mean change in spherical aberration after WFG-LASIK using the STAR S4 excimer laser combined with a previous aberrometer version (Wavescan) was 0.18 μm (6-mm pupil). In conclusion, WFG-LASIK using the STARS4 excimer laser platform with IR technology and combined with a new Hartmann-Shack wavefront sensor capturing 1250 data points from a 7.0-mm pupil and using Fourier reconstruction for aberration data is safe, predictable and efficacious for the correction of myopia or myopic astigmatism. This precise level of correction is combined with a preservation of the quality of ocular optics, maintaining postoperative HOA within a physiological range. A longer follow-up is necessary to study other aspects of surgery, such as refractive stability and change in visual symptoms with time. 1Ophthalmology, Private Practice and 2University of Sydney, Sydney, New South Wales, Australia Received 17 September 2014; accepted 18 September 2014. 1. Schallhorn S, Brown M, Venter J, Teenan D, Hettinger K, Yamamoto H. Early clinical outcomes of wavefrontguided myopic LASIK treatments using a newgeneration hartmann-shack aberrometer. J Refract Surg 2014; 30: 14–21. 2. Shaheen MS, Massoud TH, Ezzeldin H, Khalifa MA. Four-year visual, refractive, and contrast sensitivity outcomes after wavefront-guided myopic LASIK using an advanced excimer laser platform. J Refract Surg 2013; 29: 816–22. 3. Feng Y, Yu J, Wang Q. Meta-analysis of wavefrontguided vs. wavefront-optimized LASIK for myopia.Optom Vis Sci 2011; 88: 1463–9. 4. Zhang J, Zhou YH, Li R, Tian L. Visual performance after conventional LASIK and wavefront-guided LASIK with iris-registration: results at 1 year. Int J Ophthalmol 2013; 6: 498–504. 5. Taneri S, Oehler S, MacRae SM. Aspheric wavefrontguided versus wavefront-guided LASIK for myopic astigmatism with the Technolas 217z100 excimer laser. Graefes Arch Clin Exp Ophthalmol 2013; 251: 609–16. 6. Khalifa MA, Allam WA, Shaheen MS. Visual outcome after correcting the refractive error of large pupil patients with wavefront-guided ablation. Clin Ophthalmol 2012; 6: 2001–11. Click here for more information about: Laser Eye Surgery Sydney.